Spring fashion means bright colours and cheerful patterns are now back in vogue. While we love neutrals and monochrome looks throughout winter, we’re more than ready to embrace a brighter side of our closet when spring comes around. 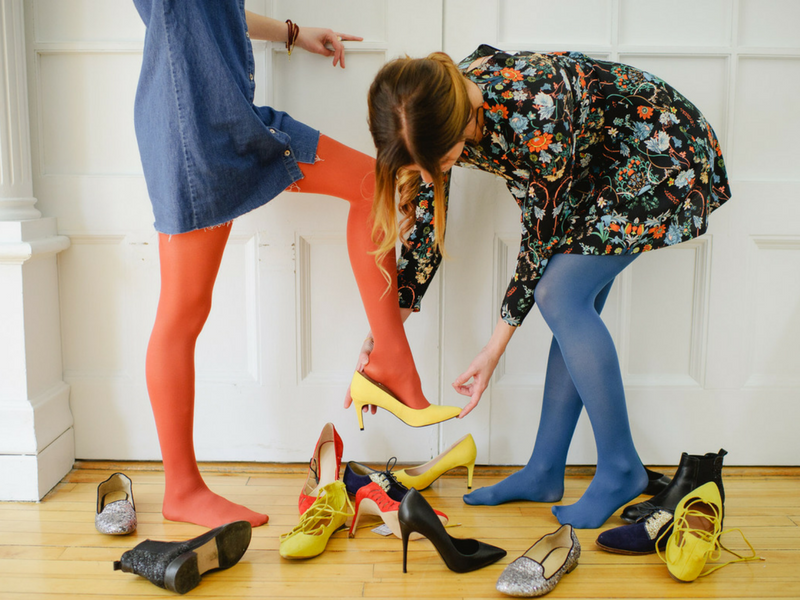 And adding colourful tights to your wardrobe is the easiest way to bring some colour into your life. Denim dresses are always a complimentary piece to wear with colourful tights. Since denim might as well be a neutral, it makes sense that they pair well with almost any other colour—like ochre, blackberry, or khaki. Has there ever been a better look for spring than a good floral? We think not. And pairing your florals with a pair of colourful tights takes your look to the next level. Choose your colour by picking up on one of the colours in the floral pattern to tie your look together. Nautical? Sign us up! Don’t be afraid to pair navy and white stripes with a pair of red colourful tights. But don’t stop there, either. Mix and match any stripes and tights combo your heart desires! If you dare, start with a pair of colourful tights (any colour you choose! ), and build and outfit using different shade of the same colour. Imagine a gorgeous outfit of various shades of maroon, blackberry, and other beautiful berry tones. Try a pair of colourful tights with your favourite colour-block dress. It’s a totally mod style that will have you turning heads! Okay, this option might be the scariest of them all, but you can do it! If you find a cute t-shirt dress in the same exact colour as your favourite colourful tights, rock it! Break the matchy-matchy taboo and let one bright colour take over your outfit. Not bold enough to wear that look just yet? Start by pairing accessories in the same colour as your colourful tights, and work your way up to a bolder look. What colours are you most excited to wear for spring? Let us know in the comments!